The Air Royale event is bringing us some really cool skins. Now that the v8.40 Fortnite update has been revealed and added to the game’s patcher, data miners are working on its files to reveal exclusive information about what’s coming to the game in the next few weeks. 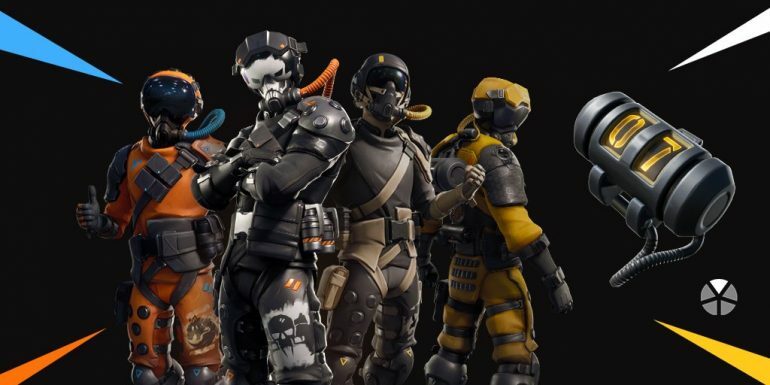 Prominent data miner Lucas7yoshi has found several cosmetic items that players might soon see in the Item Shop. One set has four pilot outfits called “PilotSkull” in the files, and they seem like a perfect combo to come to the game now that the Limited Time Mode with planes,Air Royale, is coming. Apparently, all these pilots are variants of the same Legendary cosmetic item, Supersonic. They’ll come with a Legendary back bling called Gauge, which is a reactive cylinder that displays how many players you’ve eliminated in that match. The data miners also revealed other cosmetic items. A robotic bunny outfit called Gemini seems to be ready to come to the game with a back bling called Cryo Hops. Both of the items seem to have two variants or be reactive and change during the game. One is a blue outfit with a happy face on the bunny’s helmet and the other is a black and red outfit with an angry face. The back bling seems to change the same way. Four new wraps are also coming, and they seem to match the pilot skins to some extent. They’re all called “Callsign” with a unique second name, and all of them are dotted wraps. Today’s update has revealed they’re rewards for the Air Royale challenges. These leaks aren’t confirmed by Epic Games, which means these items may never come to the game. Considering the history of this data miner in particular, it’s very likely that players will soon see all these cosmetic items available in Fortnite.